The handheld console is the right platform for The Escapists. The clean, simple pixel art, the pick-up-and-play nature of the gameplay, and the general design of the thing works best on a console like the Nintendo Switch. The Escapists 2 was released last year on other platforms, but I'm glad I waited for the Switch version. 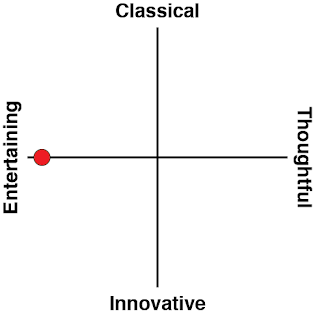 I got the superior version. The original Escapists was nothing short of a runaway success (over four million units sold, apparently), and with good reason. A prison is something that we all hope we’ll never actually experience by ourselves, and yet and the same time it has become a topic of fantasy, with a nearly endless series of films, TV shows, books and stories crafted about them. A game that lets us indulge that fantasy - when there aren't that many of them - was always going to appeal to a large number of people. Often escape is the core theme of the story. In the real would, of course, we don’t want prisoners to escape. The point of a prison is to put distance between us and those people who society cannot trust not to harm it. Certainly it’s not a failproof system, with people being mistreated in there, others being wrongly sent to prison in the first place, and the close relationship between the prison system and various cultural strains of racism that run through our (western) societies. At the end of the day, however, were you to ask people a simple question in isolation “would you rather there be prisons, or no prisons?” most people would accept the need for incarceration. But in the realm of fantasy, and the process of turning the prison into an exotic location that we aren't familiar with, there's no need to consider what prisoners in the real world are really like, or how they interact with the rest of society. You’ll notice that very few prison break stories deal with the ramifications of what comes next when prisoners (who are not wrongfully accused) go on the run. Instead, the fantasies that we conjure around prisons make the prison experience a reflection on the person. “We are captives of our own identities living in prisons of our own creation,” – this quote from Prison Break summarises the way prisoners are portrayed in most prison. From there, the prison break itself becomes a thrilling puzzle of the mind and exploration of the personality. To use Prison Break as an example again, what made that show so compelling was the way that it brought numerous personalities together and how each of them used their own characteristics to contribute to the overall escape effort. There’s very little character on display in The Escapists 2. There’s a lot of humour in the interactions and snippets of dialogue that go on around you as you carefully scope out the prison and devise a plan to escape, but each NPC character in each prison is interchangeable – little more than a resource to be utilised in the prison escape if you so choose to. Your own character is a mute, blank slate. 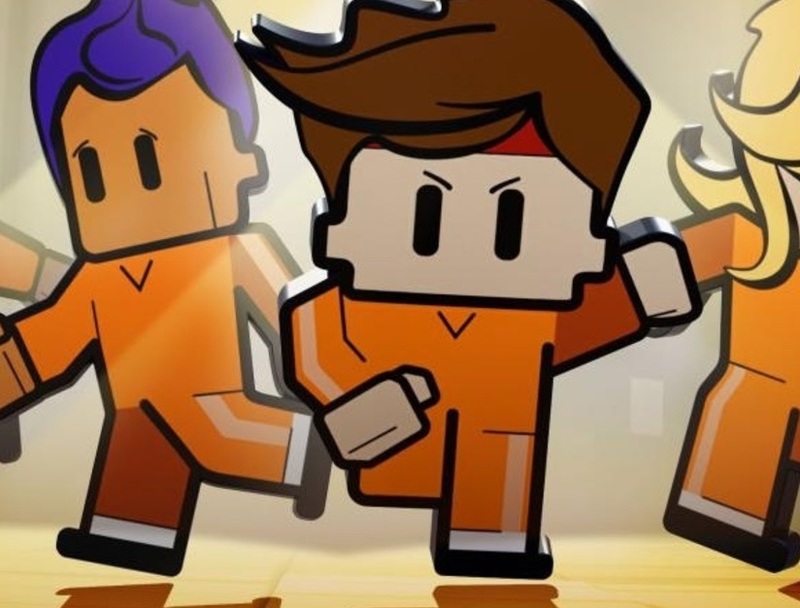 With each prison break, the narrative comes from the sandbox, open-ended nature of the game and the fact that each player will devise their own unique escape strategy. With that in mind, The Escapists 2 has two specific strengths over its predecessor. The first is that there are more ways to plan out an escape. More options means more unique strategies, which makes The Escapist 2 the better canvas with which to draw your story out. That, in turn, gives it more character and personality as you’ve got a greater range of ways to put yourself in the experience. It’s still not perfect, and there were some levels where I could see things I would like to try, but just couldn’t because the engine wouldn’t let me, but nonetheless, The Escapists 2 welcomes and encourages experimentation. 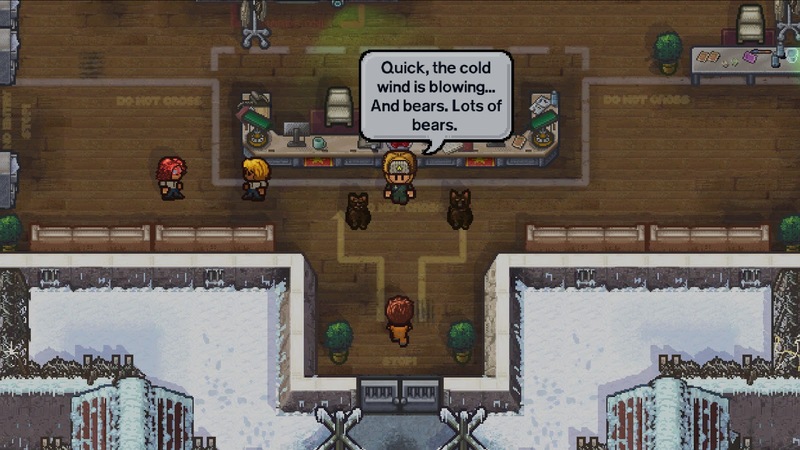 The second enhancement that really helps The Escapists 2 outperform its predecessor is the multiplayer mode. Now, just like in Prison Break, you’ll be able to form a crew, each with their own ideas on how to go about breaking out, and you’ll be able to work cooperatively to make that happen. This feature is a limited in execution and light-on with the actual cooperative elements, so it’s difficult to come up with truly fiendish strategies for escape (and none of the prisons are built to reward that anyway), but there’s still a fundamental thrill in working with other players around a centralised plan. 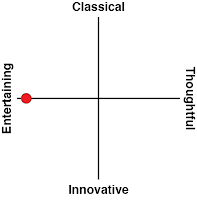 The game itself, for people who haven’t played it before, is clean, but feature rich. As is obvious, you’re an inmate in a prison, and your goal is to simply escape. That’s the one and only direction the game gives you. From there it’s entirely up to you how to do it. You can try crawling through vents, digging under the walls, or figuring out some way to simply wander on out. The one major catch is that you also have a daily schedule, and if you don’t follow it - for example if you don't show up for rollcall - you’re going to set the alarm off and people are going to come looking for you. So you’ll also need to time your escape attempt for free time, or some other point where you’ll not be monitored for a while. To do that you’ll need tools. You can collect some raw materials and craft them yourself, in what is a rich and nuanced Minecraft-like crafting system, or you can acquire tools by doing jobs for fellow inmates, helping guards out (so you can get access to otherwise inaccessible areas), or simply beating people up and taking their stuff. You’ll also want to spend time in the gym, building your physical strength, and in the library, building up your intellectual acumen. 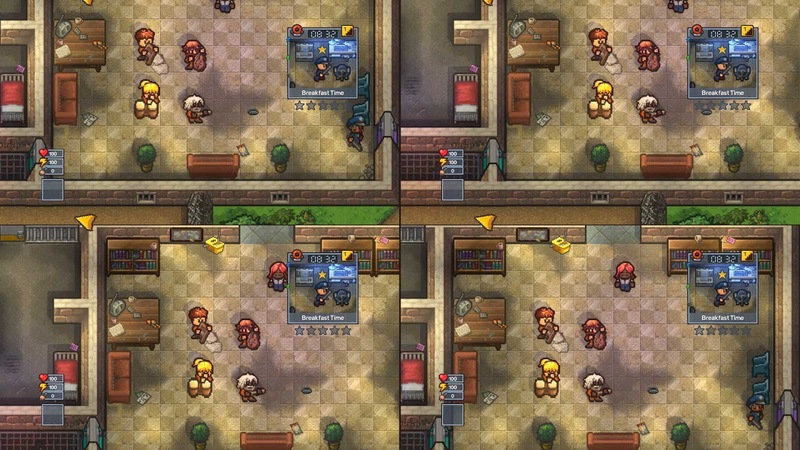 The game features a great range of prisons to break out of, from minimal security near-hotels, through to maximum security nightmares, and three transit prisons across land, air and sea. You'll even get to go to space. That's one amazing level. Otherwise, the game is functionally similar to its predecessor; improved art gives you more detailed sprites and environments, but The Escapists wasn’t an ugly game itself. There are some new items that you can craft, in line with the game’s expanded range of escape options, and a new combat system improves that side of the game (without actually making it a game that you’ll be playing for the combat). 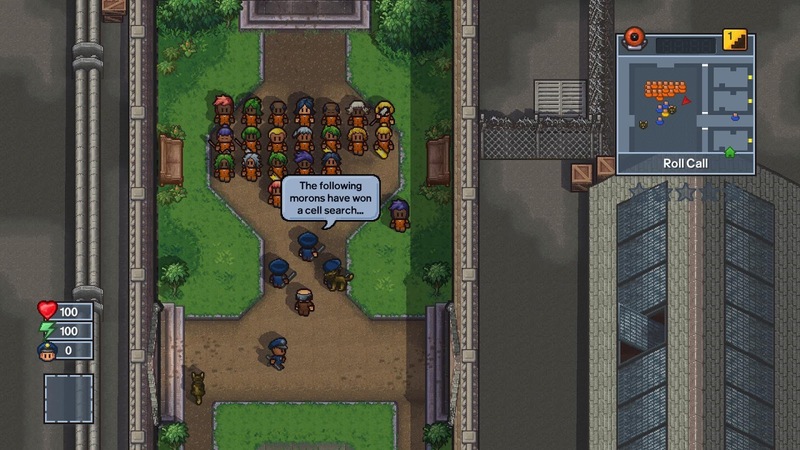 Ultimately, The Escapists was such a success because it was fun, entertaining, and smart. You could perhaps argue that the sequel doesn’t do enough to build on the foundations of the first, but that’s only if you don’t use the multiplayer options. Those alone breathe fresh air into the whole experience, and, as I said at the start, the Nintendo Switch hardware itself is just perfect for Mouldy Toof’s endlessly entertaining vision.